What’s that, Steam? I’ve played this game for 6 hours, and I’m still bad at it?! Be that as it may, I still have a blast every time I crank up the volume for some twin-stick shooter action, where the musical selection determines just what the game throws at me! 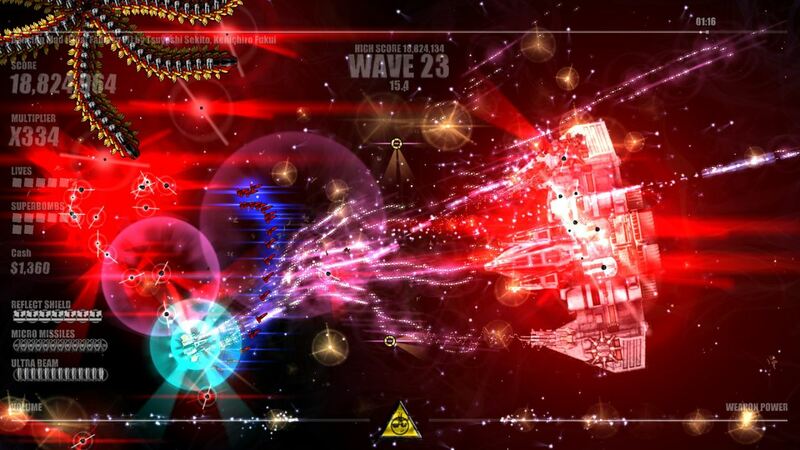 Basically, a twin-stick shooter is where your character (or in this case, ship) is controlled from a top-down point-of-view, with one stick for movement and another for aiming (PC owners without a gamepad can use a mouse in place of the second stick), with strong emphasis on scoring points while staying alive. Some titles also have power-ups and similar “bonuses”, which aids in fending off the inevitable repetition factor that score-based titles tend to suffer from. Now, I know that comparisons aren’t always a good thing, but there’s really no getting around that 2003’s Geometry Wars: Retro Evolved pretty much reignited the gaming world’s interest in the genre that Beat Hazard also fits into – even if Geometry Wars wasn’t the first game in the genre (hint: Robotron 2084). Since then, plenty other games have adapted a similar style, but to my knowledge none combined arcade top-down action with music, until Beat Hazard came along. Imagine the randomness of enemies spawning in titles like Robotron 2084, Geometry Wars and Super Stardust HD, controlled by the beats of the song currently playing! That’s what you get with Beat Hazard. Your music does more than simply control enemy spawning, however, as the intensity of a song determines your ship’s weapon strength, so if you want some asskicking firepower, you should be listening to Bon Jovi or Metallica and not Elton John or [random boyband], or you may find your ship somewhat unable to perform. It’s the one thing that may turn people off from this title, and it lies in the visual department. The game is not ugly or anything like that, but the amount of flashing lights and extreme effects can be a bit overwhelming – even with the adjustable slider that Cold Beam Games thankfully implemented. In Beat Hazard Classic, you could only toggle between 70% and 100%, which was definitely helpful but not enough.. being able to take it down to 50% made the game much more playable in my opinion. Even though it’s “part of the game”, as they say (for better or worse), I still find it odd that they didn’t include the expanded visual feedback slider in a patch, instead of in premium (“not free”) DLC. Thankfully the DLC does add a LOT in terms of content, making it a worthwhile purchase on top of the visual feedback slider tweak. With plenty of modes (including Boss Rush and online multiplayer, with Ultra) and a randomness factor that expands well beyond your own musical library, thanks to a customizeable list of Internet radio stations, ensuring no two games play the same – this one definitely has staying power! Also, for those of you with iOS devices, enjoying Beat Hazard on the go is about to become a reality, as the release of the iPhone/iPad version is apparently not far away. PC version can be bought from Steam, GamersGate or Direct2Drive. 360 version is, as always, on the marketplace. PS3 owner? Hit up PSN.